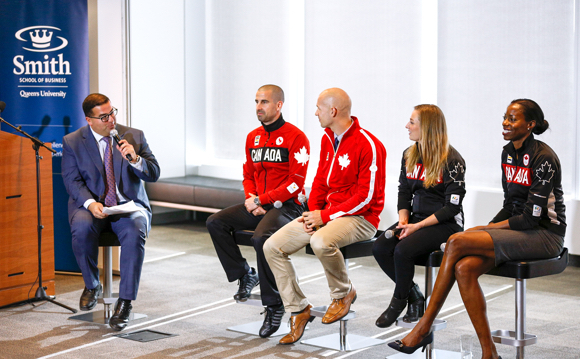 Arash Madani from Rogers Sportsnet with Olympic athletes at the Smith-COC partnership launch on November 3. TORONTO – Today, the Canadian Olympic Committee (COC) and Smith School of Business at Queen’s University announced an eight-year strategic partnership that will provide scholarships for COC athletes, shared coaching synergies and customized leadership training for COC staff and partners. Smith will be the first business school to become a Team Canada partner and the exclusive provider of business education for the COC. The announcement was made at Smith’s Toronto campus by COC Chief Executive Officer, Chris Overholt, and David Saunders, Dean of Smith School of Business, with several Olympic athletes in attendance. Up to 1200 Game Plan athletes will be eligible for scholarships for a broad range of Smith School of Business programs, such as the Graduate Diploma in Business, the Master of Entrepreneurship and Innovation, and Smith’s suite of MBA programs, among others. Programs are offered in a variety of locations across Canada, some with flexible learning options that can accommodate athletes who are still training. Both the COC and Smith share a high-performance coaching culture. By sharing best practices through workshops and networking, Smith will develop “Coaching 2.0” — the next level of coaching to enhance team-based learning and coaching in business education at Smith. The COC will also invest in enhanced leadership training with Smith for COC staff and other sporting community members through customized and open enrollment executive education programs. Canadian Olympic Committee leads the achievement of the Canadian Olympic Team’s podium success and advances Olympic values in Canada. Independent and predominantly privately funded, the Canadian Olympic Committee delivers resources that Canada’s elite athletes need to prepare the Team for the Olympic, Youth Olympic and Pan American Games. By sharing our athletes’ stories, we inspire all Canadians through the power of sport: 24 hours a day, 7 days a week, 365 days a year. 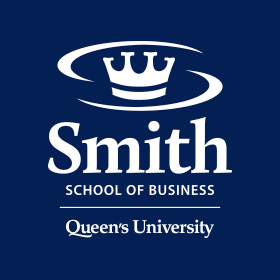 Smith School of Business is one of the world’s premier business schools — renowned for exceptional programs, outstanding faculty and research, and the quality of its graduates. Canadian executives regard Smith as Canada’s most innovative business school, offering students academic excellence and a superior overall experience. Smith School of Business — where Canada’s first Commerce program was launched in 1919 — is located at Queen’s University in Kingston, Ontario. The School also delivers programs at locations across Canada, as well in the U.S., the Middle East and North Africa (MENA) region and China.